On a bright Sunday morning, Sylvie, Annie, and I gathered at Erikia’s house for the August Charm Exchange. I couldn’t wait to see what everyone had brought, and our little group delivered handsomely with both well-crafted and gorgeous charms and a delicious potluck brunch. There were breakfast sandwiches and pastries from local shops, a yogurt parfait bar, a homemade raspberry gelatin, fresh fruit, a cheese and bread plate, and mimosas! With our plates loaded, we headed to Erikia’s enchanting backyard where she had a table set up for us under her brand-new canopy. She’s very excited about using the new canopy at her booth in the upcoming Salida Fiber Festival, where she will be selling her vintage tin stitch markers. She’s done an amazing job preparing for the festival, punching out the markers from antique tins and then professionally finishing and stamping them. 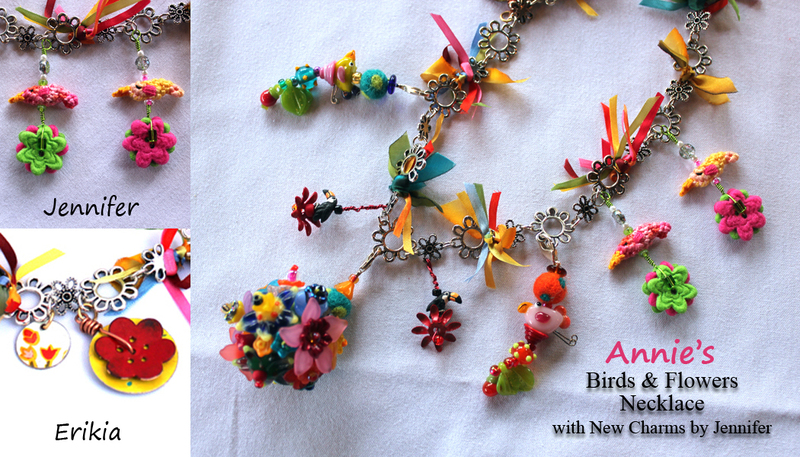 She used similar techniques to create her charms for Annie’s Birds & Flowers necklace. The red flower is made of copper, which she shaped into a curve before enameling it with powders and a torch to give it its vibrant color. 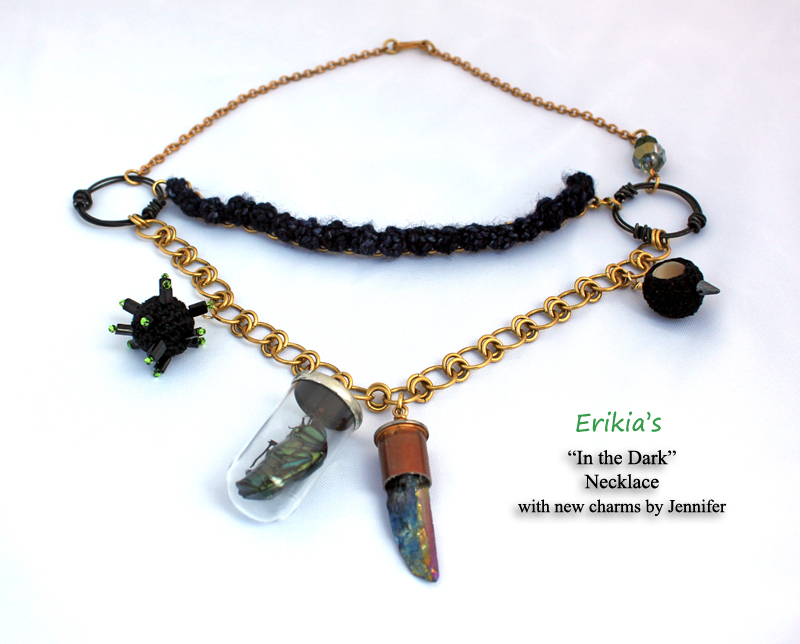 I crocheted my charms for Erikia’s In the Dark necklace using No. 10 crochet thread and a size 11 steel crochet hook. Working in this small scale presented a huge challenge for me. It took me several tries to get it right. For my first attempt, I crocheted the spider from the book Itty Bitty Crocheted Critters, but I didn’t really take the legs into account when I was working on the body. Although the body was only about an inch long, the legs made the whole thing over three inches! 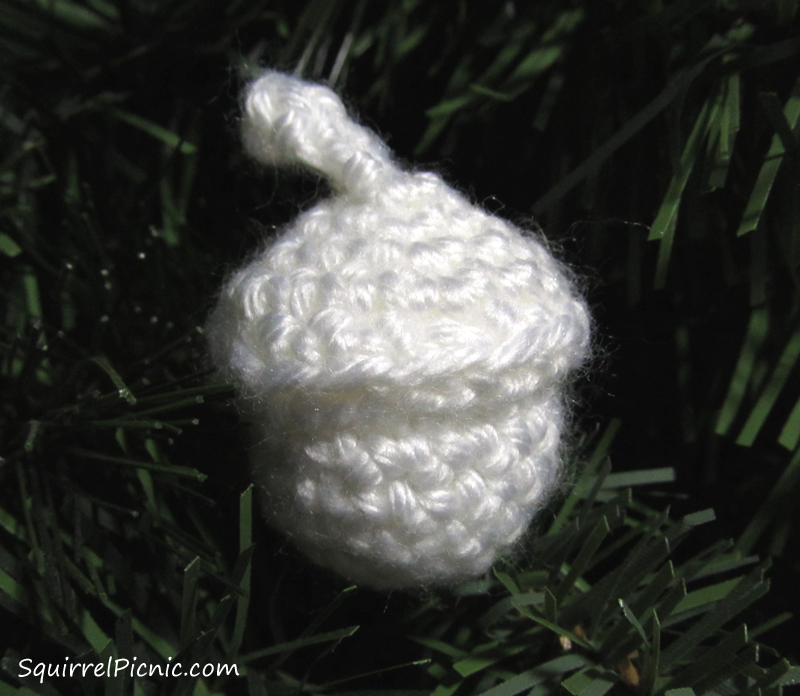 Then I tried just crocheting small balls to see what I could come up with. Stuffing these balls with Fiberfill revealed that I would need something sturdier inside to preserve their shape. I finally found some bronze-colored Bakelite beads in my stash that I thought would be a good fit both in size and color for Erikia’s necklace. 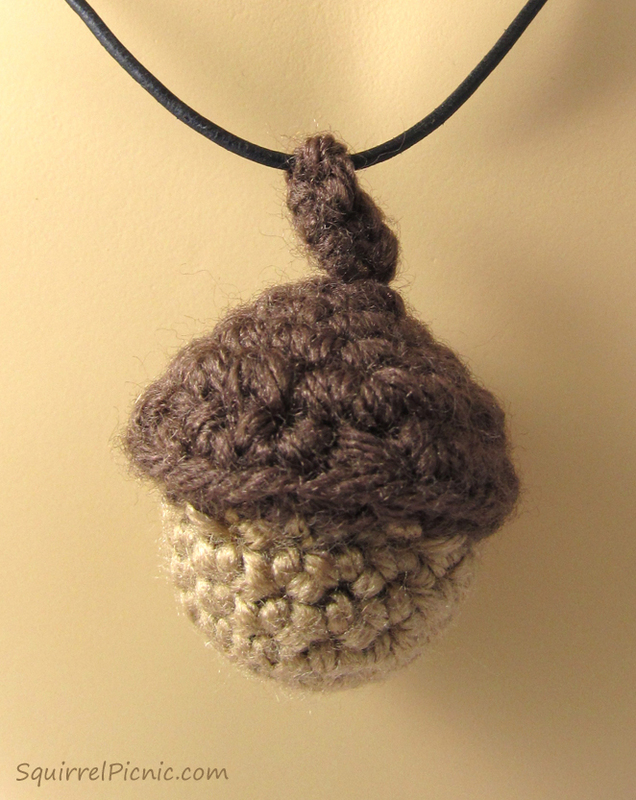 I crocheted around the first bead and fastened off before it was completely covered, allowing the bead to show through. For the other bead, I ended up enclosing it completely and then sewing on small black and green beads to give it a spiky texture. 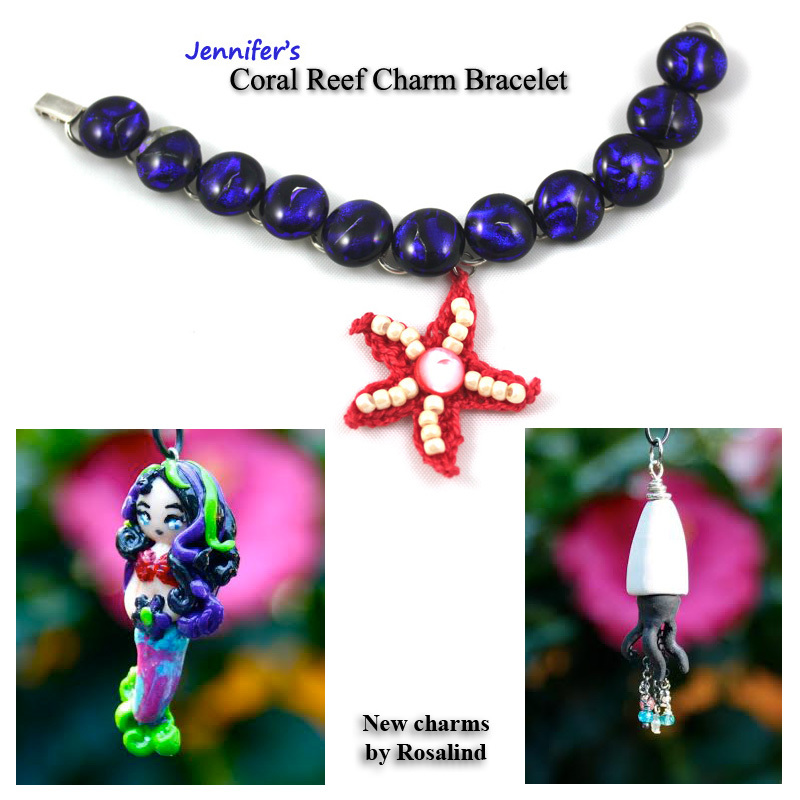 Rosalind used polymer clay to sculpt a mermaid charm and a squid charm for my Coral Reef bracelet. In the squid, she also added oxidized sterling silver chain and some gemstones. Even though she also found that working in this scale has its difficulties, I’m so impressed by all the detail she has managed to include in these charms. Keep in mind that they are under an inch long! Sylvie created a tiny diorama inside a mini pocket watch for one of her charms for Rosalind’s Garden of Earthly Delights bracelet. It features a teeny baby with Monarch butterfly wings amid the moss of a forest floor. 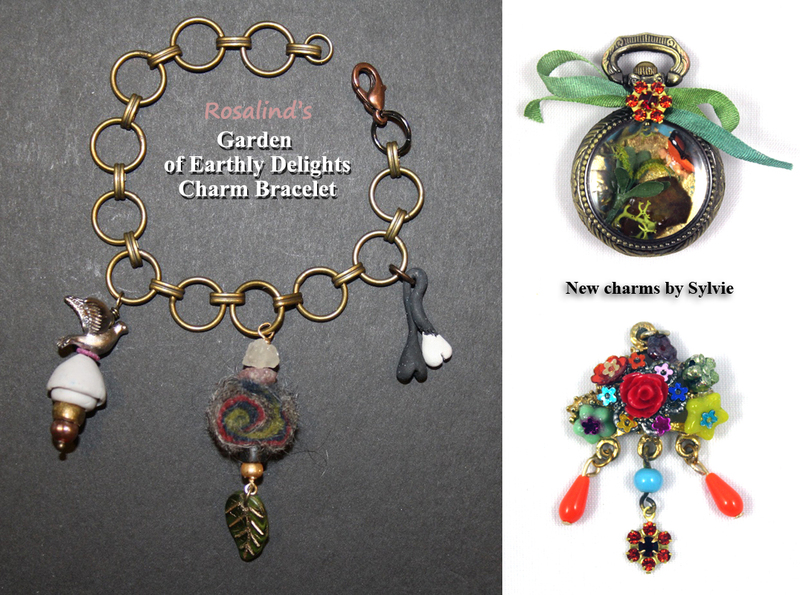 For her second charm, she brought new life to a piece of broken jewelry with the addition of colorful vintage floral beads. Rosalind and I weren’t alone in our struggle with scale. Annie agrees that making charms this tiny poses a challenge, but I think she succeeded handily with her felt and bead charms for Alexandra’s Kokeshi Doll bracelet. All of the stitching is painstakingly done by hand, and as always, Annie’s eye for color shines through. 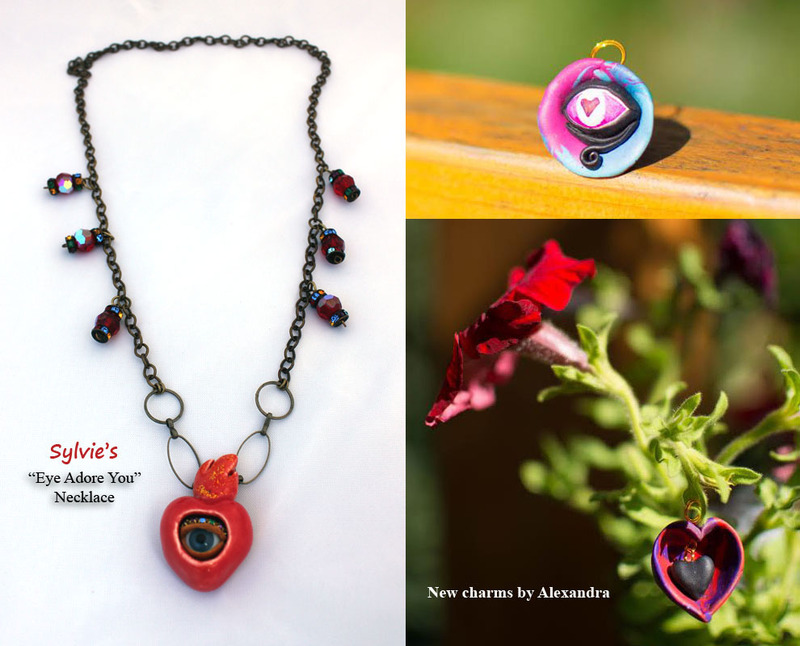 Alexandra sculpted her charms for Sylvie’s Eye Adore You necklace in fimo. Most of her experience is with sculpting people or animals, so working with this subject matter was a challenge for her. 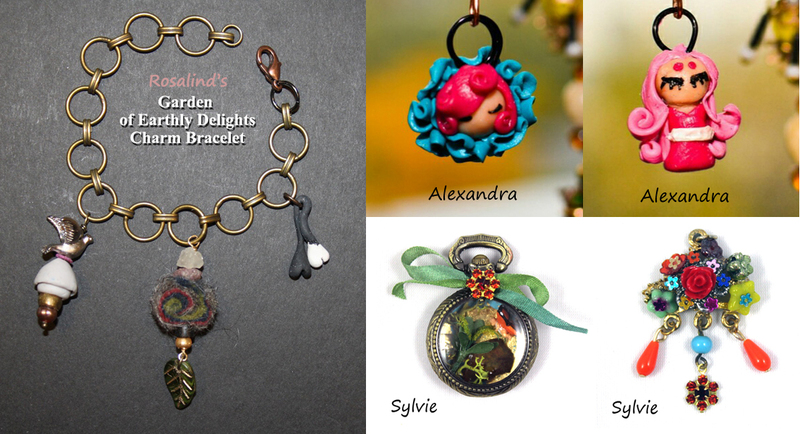 It forced her to think outside the box, but it also left her inspired to start on the next set of charms right away! These ladies have inspired me too. 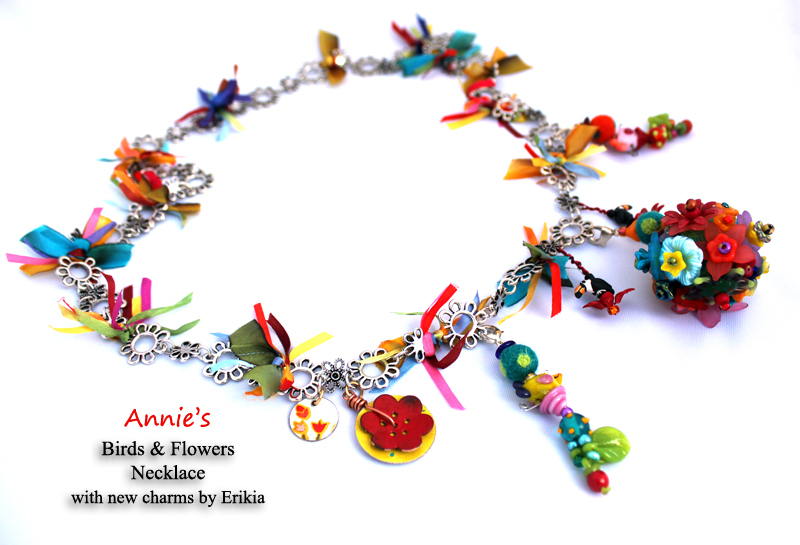 I can’t wait to get started on my charms for Annie’s Birds & Flowers necklace. We’ll be meeting again in October, and until then I think I will try working with lighter thread and a smaller hook to see what I can come up with. I might need to invest in a magnifying glass. Categories: Friends, Make It | Tags: bracelet, charm exhange, clay, crafts, crochet, diy, friends, jewelry, necklace, sculpt, tin | Permalink. A recent invitation to participate in a charm exchange has brought me the opportunity to explore the wonderful world of miniature amigurumi. An exchange like this brings artists together to collaborate in the making of each other’s charm necklace or bracelet. Our group includes artists in a variety of mediums: ceramic, mixed media, felt, beads, metal, and found objects. And I get to contribute crochet to the mix! Each of us gets to pick a theme for our jewelry piece, and I chose coral reefs. Imagine all the colorful things we could do with that! But first I have to make a charm myself to get my bracelet started. What reef creature could I make? 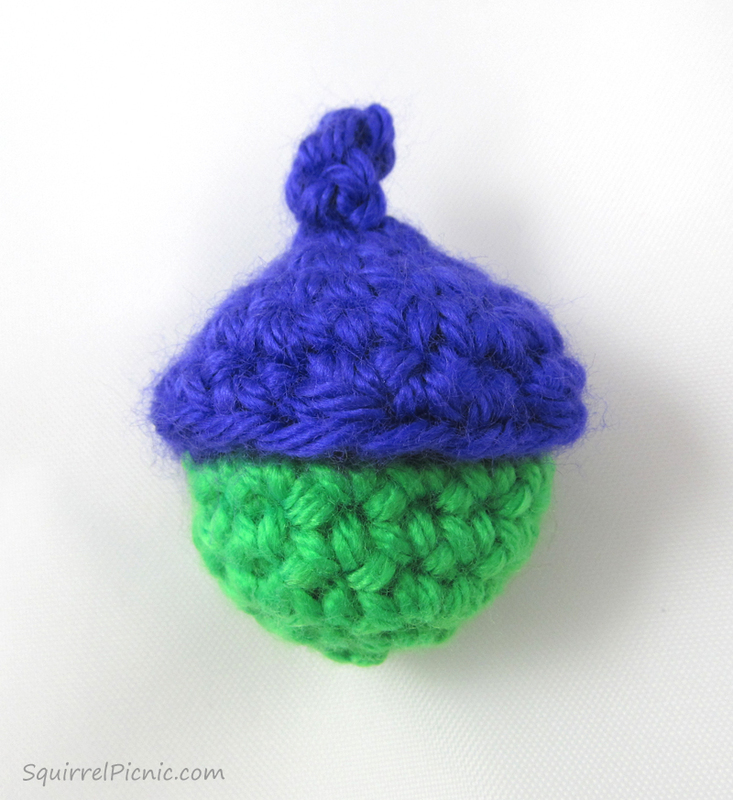 First things first, I’ve never crocheted anything this small. 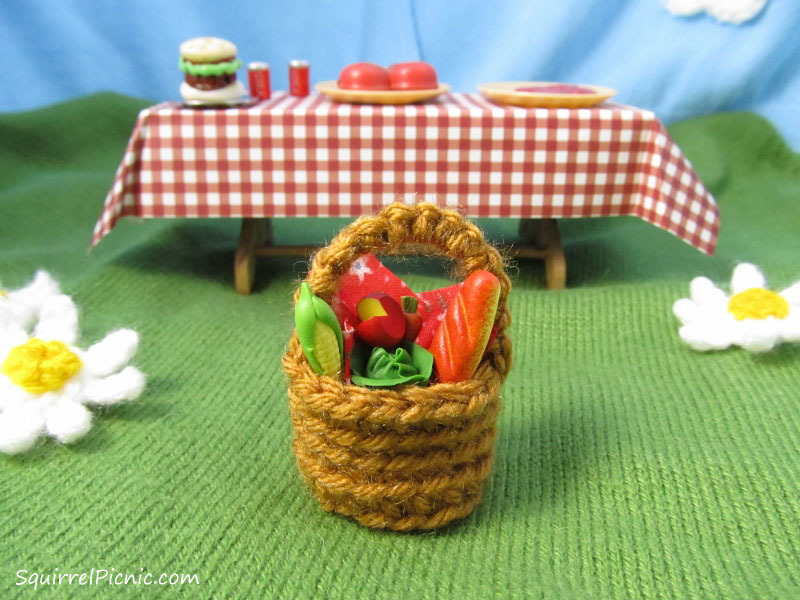 I think the smallest piece I’ve done is the picnic basket that is about 2” tall. Just to practice, I tried making an urchin, thinking it was a simple shape… but it was too simple and it just looked like a ball. After trying a few more sea creatures, I decided to make a starfish. First I attempted to convert a life-sized starfish pattern to this scale by using DMC floss and the smallest size hook I could find. But no matter what I tried I couldn’t get it small enough. 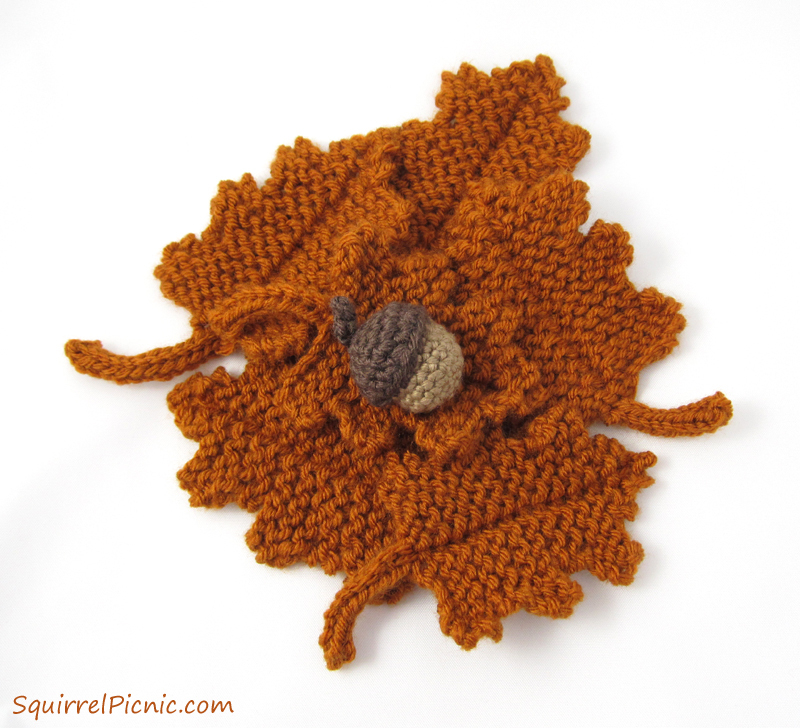 It made me realize that miniature crochet has its own tricks and rules! I do have a lot to learn. I needed extra-small materials and extra-small patterns. I went to my local craft store with all my crochet hooks in hand to try to complete my set of steel hooks. I love how inexpensive steel hooks are! For under $20 I was able to get all the hooks I needed, from size 00 to size 14. I was also able to find crochet thread and 100% Pearl Cotton Thread in Size 5. My friend Annie let me borrow her Size 8 thread to try. Now I feel sufficiently equipped for this challenge. I also found some books about miniature crochet that are bound to help. Mini Amigurumi by Sara Scales includes patterns for a wide variety of cute little gems from birds to babies to fruits and vegetables. Some are as small as 1/2”! Itty Bitty Crocheted Critters by Erin Clark includes patterns for some really interesting creatures like a flamingo, gecko, and crocodile. I’ve seen works from fellow crocheters done from these patterns and I can’t wait to try them out too. We’ll be making charms for this exchange and meeting every other month over the next year. It will be exciting to see if I can improve my skills over this time. And I can’t wait to see what everyone else makes too! I’ll share with you more in the coming week about how the charm exchange works. 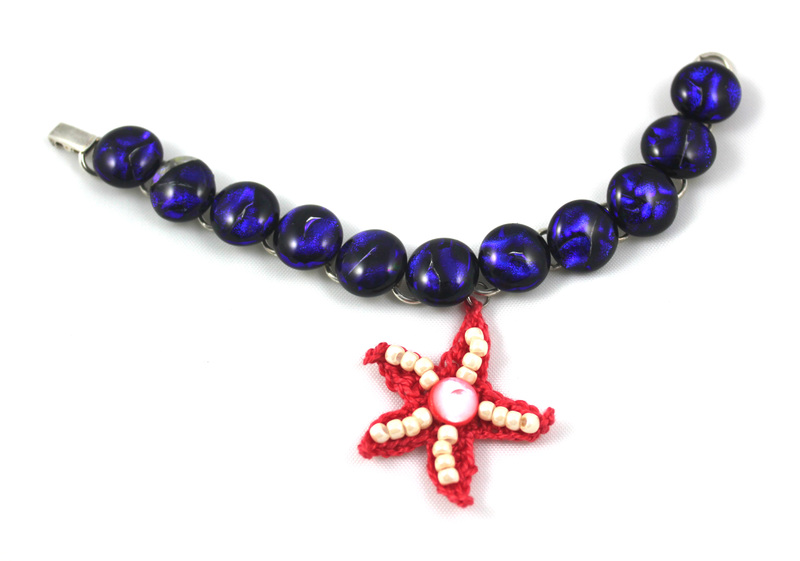 Until then, here’s the crochet pattern for the starfish I made for my own bracelet. I’m wondering if any of you have tried miniature amigurumi. 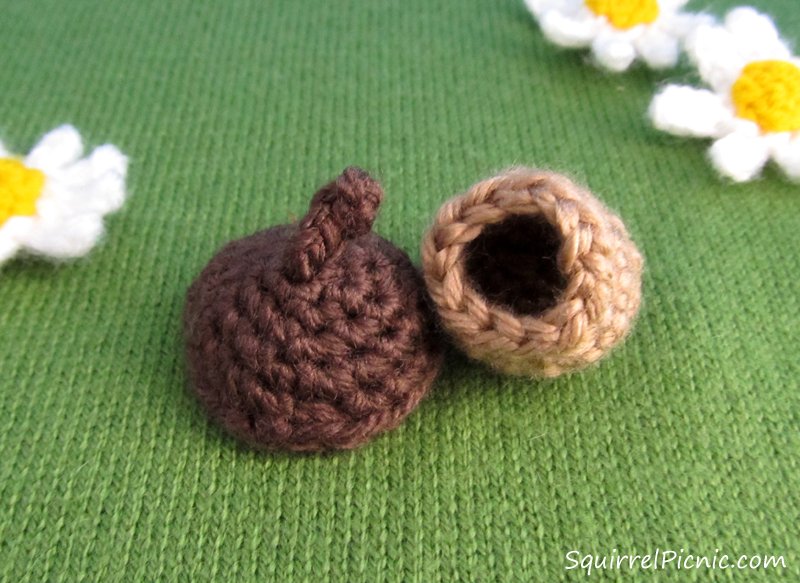 What’s the smallest thing you’ve ever crocheted? 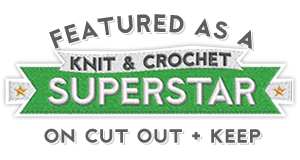 Categories: Crochet It, Friends, Uncategorized | Tags: bracelet, charm, crafts, crochet, diy, exchange, jewelry, jewelry making, necklace, reef, starfish | Permalink.